Turn a large glass candle holder into a beautiful centerpiece for spring. 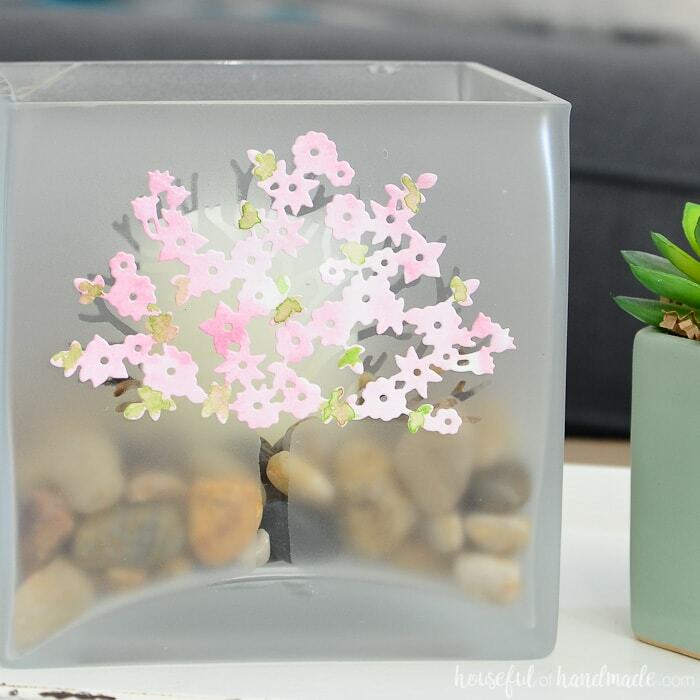 A frosted tree design and watercolor spring blossoms are the perfect way to dress up a boring square glass jar. It’s the perfect budget home decor for spring. 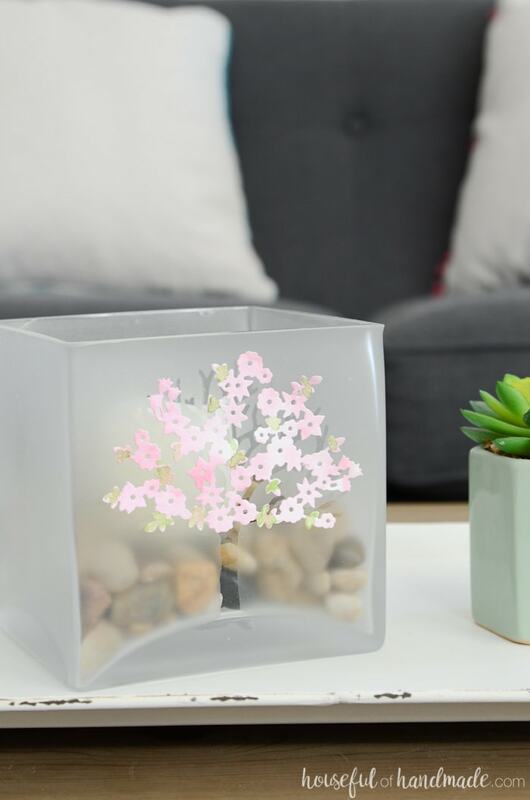 Decorate your home for spring with a large glass candle holder decorated with spring blossoms. This simple craft is the perfect way to shake the winter blues. 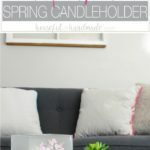 I partnered with Spellbinders to turn a boring glass candleholder into a beautiful piece of decor to transition the home into spring. Perfect for centerpieces or your spring mantel decor. The weather is starting to warm up here. I know, it’s still early, but I am itching for days in the yard and the warmth of sunshine! And my absolute favorite part of spring is when the trees in our neighborhood are covered in bright pink and white blossoms. That is when I know I can officially say goodbye to winter. Since it is too early for the actual trees to start blooming, I decided to take matters into my own hands and make some blossoming trees for decoration. When I saw the Spellbinders Four Season’s dies by Lene Lok, I knew they would be perfect. 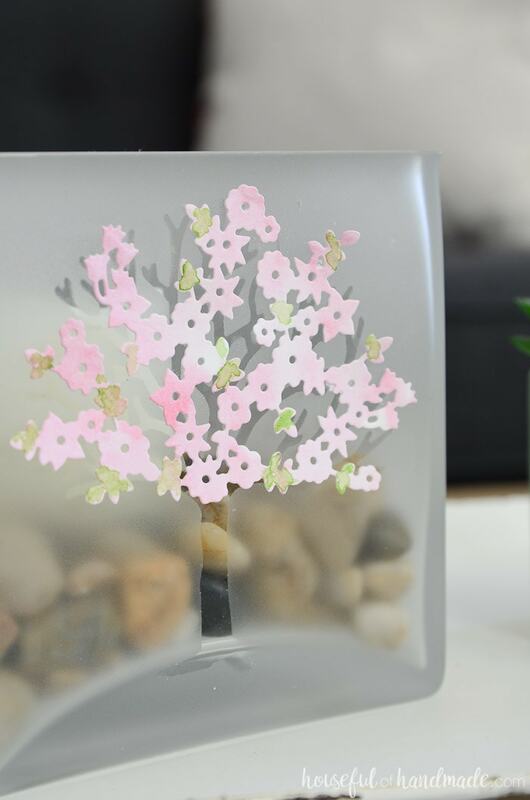 The bare tree die is ready to be decorated however you want, and I want spring blossoms. After enjoying our simple winter decor in the living room, I am ready to liven things up with some color! I am definitely thinking blush tones for our spring decor. They will pair nicely with our grayish-navy sofa and greige walls. And blush is perfect for my blossoming spring trees. 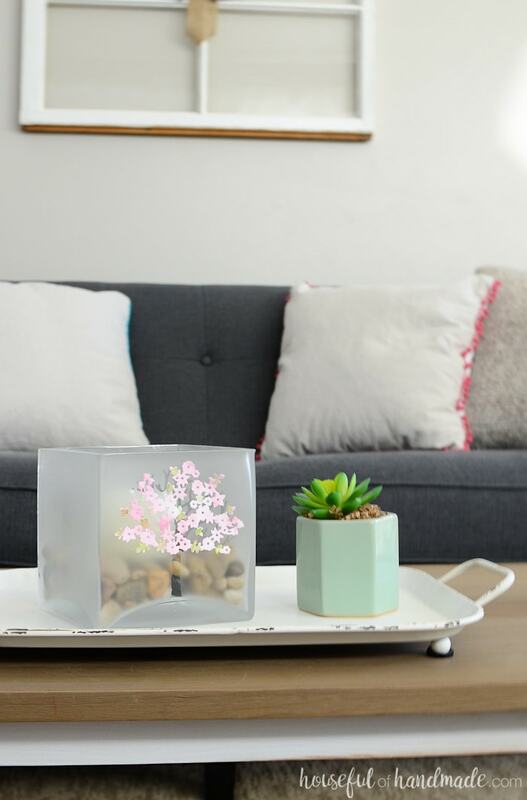 So armed with my watercolors and Spellbinders die cutting machine, I turned a square glass candle holder into a little spring for my home. 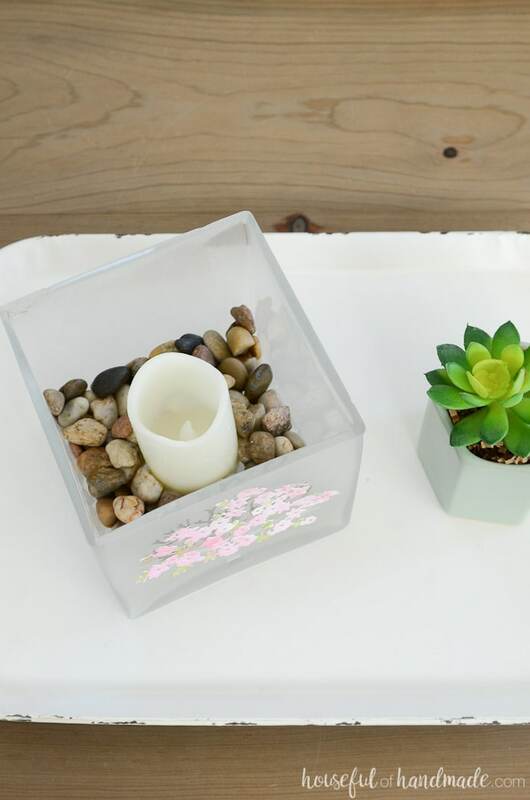 This large glass candle holder is so easy to make too. You could create a whole bunch of them for a spring gathering in no time. Imagine a table full of blossoming spring tree candle holders for a garden brunch. I can almost feel the sunshine on my back just thinking about it! Start by creating your watercolor paper for the spring blossoms. 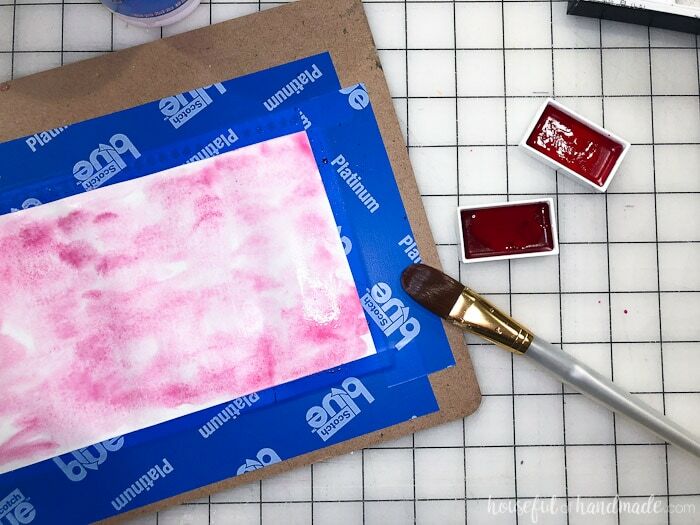 To keep the watercolor paper from wrinkling up, tape it to a board with masking tape or painters tape. I like to use an old clipboard. Wet the paper and add random splotches of pinks or red watercolor paints (I love the vibrancy and modern colors of this set). The paper will wrinkle up when wet, but the tape will hold it flat as it dries. 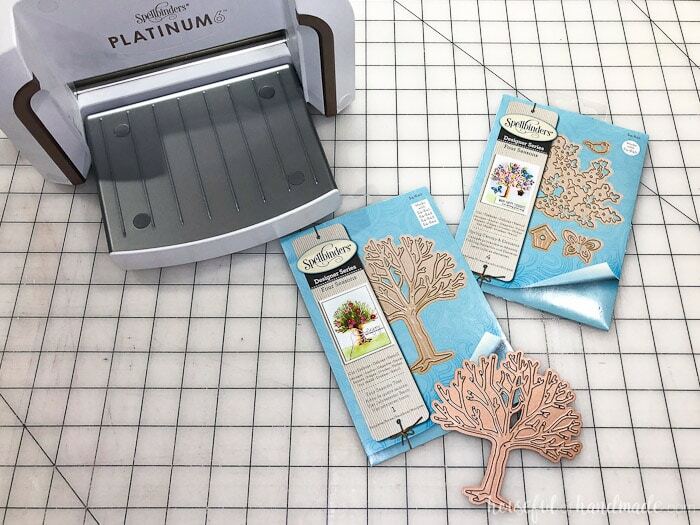 While the watercolors are drying, cut out the tree die from the transfer tape (this is my favorite transfer tape). 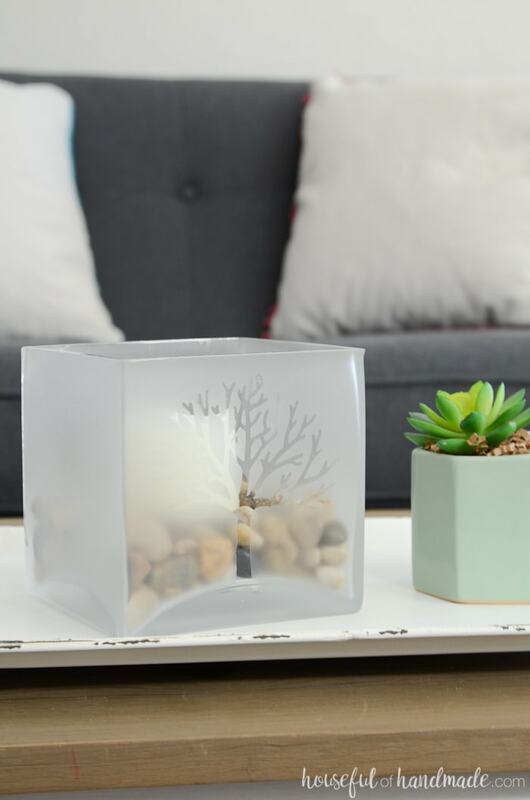 You could also use a scrap of vinyl or contact paper, you just need something to stick to the large glass candle holder that will be easy to remove. Create a cutting sandwich with the cutting by placing the cutting platform, cutting mat, transfer tape, etched die (facing down), and then another cutting mat on top. Run it through the Platinum 6 machine to cut. Clean the square glass candle holder with a cotton ball covered in rubbing alcohol to remove any dirt or grease. Peel the transfer tape backing off the cut out tree and carefully line it up where you want it on the large glass candle holder. Press it down firmly (I love my vinyl scrapers for this). 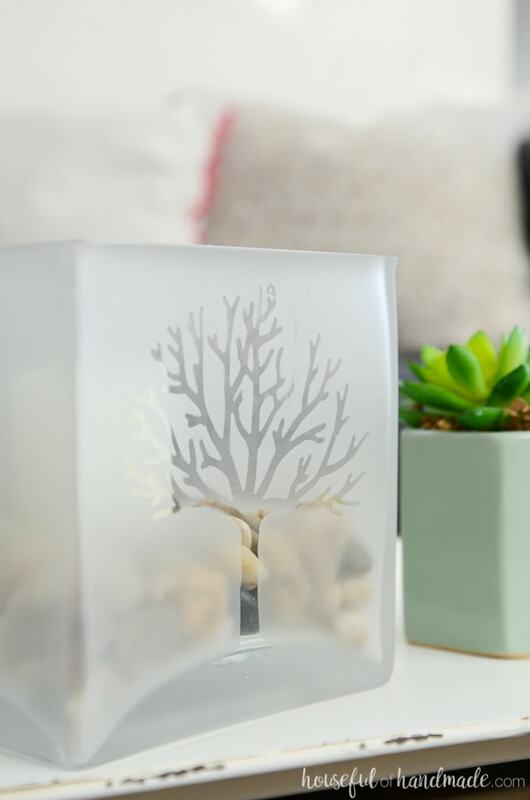 Spray paint the entire outside of the candle holder with 2 thin coats of frosted glass spray paint. To keep the paint from going inside the candleholder, I like to turn it upside down while painting it. After it is dry, peel off the tree shape. It’s looking so cool! 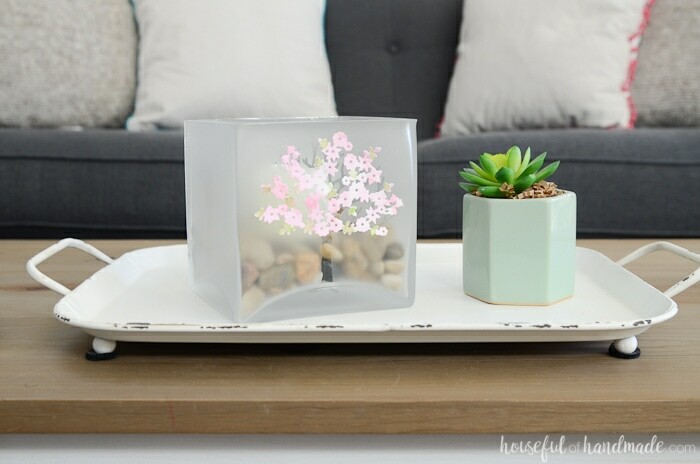 You could leave the frosted glass candle holder like this, but I wanted color and spring blossoms! (However, I might just use it like this with some pretty ornaments for Christmas…). Cut out the Spring Canopy from the dried watercolored paper. I decided I needed a little green peeking out from all those prink blossoms, so I added a few drops of green watercolor paint to the cut out die. Attach the die to the top of the tree branches with a few glue dots. I love that the canopy can be removed, and I can update it with the summer, fall, and winter canopies too. Just image this large glass candle holder decorated with the Summer Canopy holding a giant citronella candle to keep the bugs away while you relax outside. Or the Fall Canopy decorating the outside of a candleholder full of acorns. The possibilities are endless! And maybe if I keep creating spring crafts, it will encourage spring to come faster! Oh my goodness – we love the pink delicate flowers! So creative too! This turned out so pretty, and I love that you can change up the canopy throughout the year! That is my favorite part too. I love decor that can easily be updated for each season.